If diamonds are a girl's best friend, this giant rock auctioned off in Hong Kong today is… what? Life partner? Champion? Soul mate? It's sad Liz Taylor isn't alive to see (wear) this. The sparkler is a flawless oval-shaped white diamond the size of a small egg, reports the AP, and the sale set a record; the $30.6 million price beats the previous record of $26.7 million for a white diamond set in May at Christie's in Geneva. 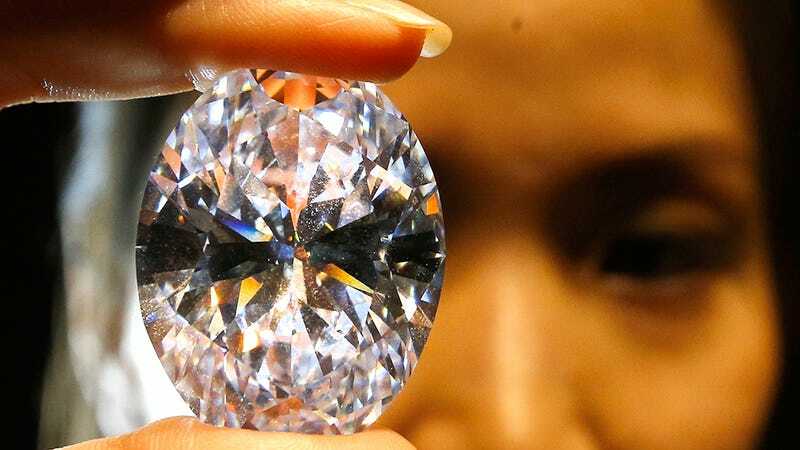 The stone, which weighed 299 carats when it was found in the rough in 2011, is the largest and most significant such diamond graded by the Gemological Institute of America. Sotheby's says it was discovered in southern Africa but won't name the country because the seller wishes to remain anonymous. The buyer is ALSO anonymous, for now, so we have no idea if warlords are selling to warlords or if James Bond was involved or if we're living in a real-life version of The Jewel Of The Nile or what. Maybe Kanye will present it to Kim as an engagement necklace? What DO you do with a gem that size? Brooch? Crown? Three-finger ring?